Oh, Tim Curry, how do I love thee? Let me count the ways. to the rakish thief of Rooster Hannigan. and your marvelous audiobook narrations that make me smile. but grows in appreciation with every single view. It's no secret that I struggle with audiobooks. I prefer my readers to speak with an accent to transport me to another place and time. On a whim I Googled celebrities who read audiobooks, and lo and behold, Mr. Tim Curry narrates none other than Lemony Snicket's darling Series of Unfortunate Events. This particular book series brought me back to the joys of reading after my passion was demolished during undergrad. 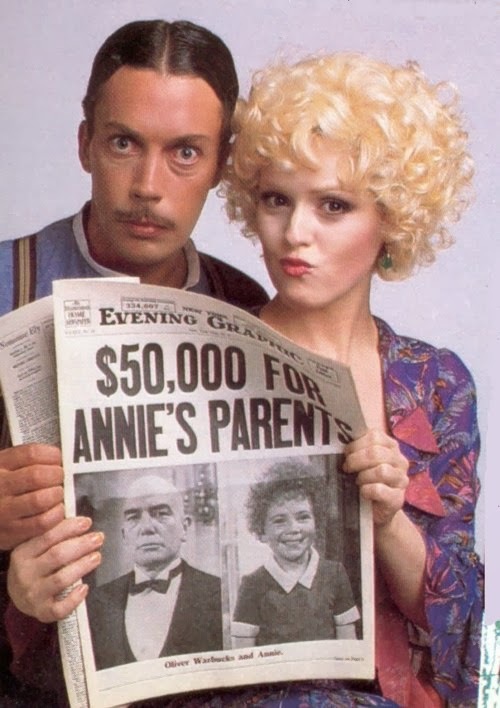 1) Rooster Hannigan in Annie. This was my movie when I was little. I watched it and re-watched and then watched it again just for good measure. Mrs. Hannigan terrified me, but I loved her mischievous, devious brother Rooster and his rather trampy female sidekick. Don't know why. The whims of a child I suppose, but watching again, Curry was absolutely perfect for the part. Seemingly self-assured looking for a shortcut in life. Genius. 2) Superhuman Samurai Syber Squad & Mighty Max. My younger brother and I (and reluctantly my mother) watched these two shows religiously every morning before school. The first was a really ridiculous life action about a cyber-villain and a group of teenagers who could transport themselves into a computer for epic battles, while the latter was an exciting animated feature and subsequent toy line. Found it on YouTube not too long ago. Awesome day. 3) Dr. Thornton Poole in Oscar. What? You haven't seen this one? Um, perhaps you should get right on that. This jewel of a comedy stars Sylvester Stallone when he still looked human and, of course, Mr. Tim Curry as a proper professor who finds himself mixed into the lives of a crazy mob family. 4) As my ode proclaims, this wonderful man is also in a Muppets movie. There's nothing really to add, and this pretty much puts him on the top of so many of my favorites lists. 5) Most of my favorite movies are from the 80s and this includes the hilarious murder mystery fun fest known as Clue. Curry steals the show as the emotional, hyper, occasionally psychotic butler Wadsworth. Sigh. Love this movie. Then there is always Legend, Home Alone 2, The Three Musketeers, Aaahh!!! Real Monsters, The Cat Returns, an episode of Psych (!!!! ), and, of course The Rocky Horror Picture Show. So on this day of red hearts and roses, I send my love to Mr. Tim Curry as a thank you for all the laughs! Clue--one of my most favorite movies b/c of the genius that is Tim Curry.